WildForestJam was the BIRTH PLACE of the OCR Sprint Races in the UK. NEW and EXTENDED COURSE – fast technical twisted forest trail course with 68 obstacles over 2.7k. 3 RACES – Every racer gets 3 races on the day! LEGEND FINALS – 10 males & 10 females with the lowest accumulated time got through to finals. FUN JAM FINALS – All remaining runners names go through a randomizing formula and 10 male & 10 females gets to enter the Fun Jam Finals. 1 Male LEGEND and 1 Female LEGEND will receive the coveted WildForestJam LEGENDS oak stump TROPHY. Roasting hot BBQ to refuel. **PLUS PLUS** – Bring The KIDS for the FAMILY MEGA FUN Mud Jump Course (+7yrs old) – 36 jumps & loads of mud & water jumps. 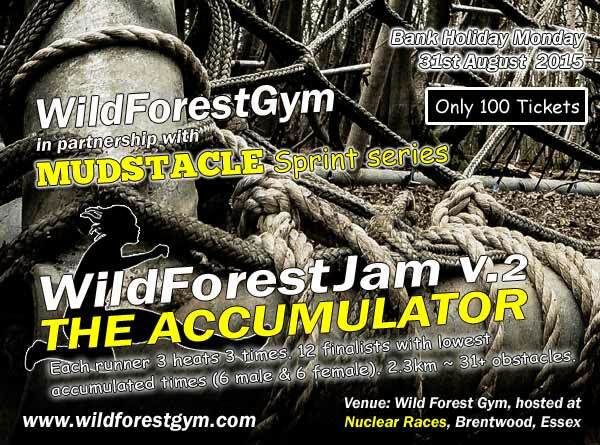 WildForestJam minimum age is 16yrs on event day. Each runner will race 3 rounds. Each round is 1 lap of the Wild Forest Gym obstacle race course. The course is 2.7k of twisted and fast forest trails with 68 obstacles. Each round will have waves of 5 runners. Separate male and female waves. Specified recovery period between each round. The times for all 3 rounds are accumulated. FAMILY MEGA FUN Mud Jump Course (+7yrs old) – 36 jumps & loads of mud & water jumps. Race & Obstacle rules will be published in advance.